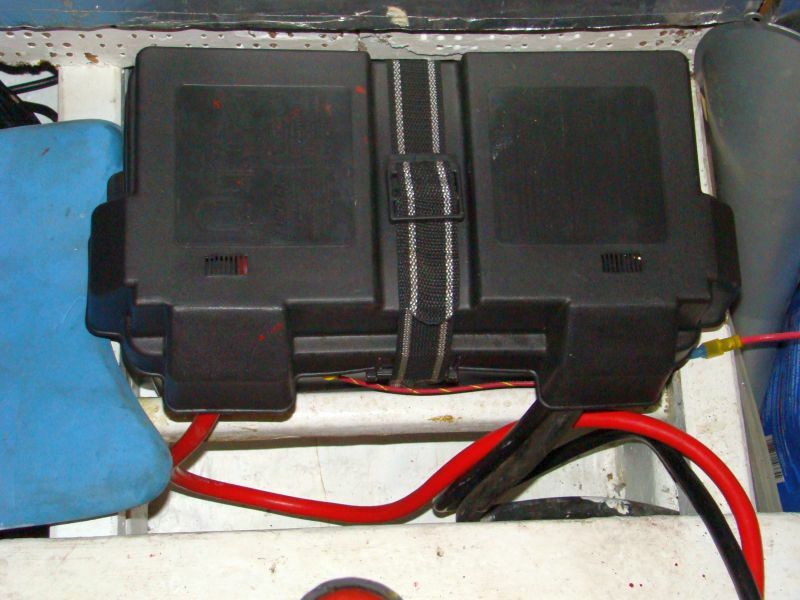 Our starting battery sits in a nice fiberglass box that is mounted in the front of the engine. The distance to our house bank is about a foot and makes for short cables and easy access to use jumper cables in case the starting battery goes dead. But this is the space we plan to use to move the house bank so that the genset can be installed. It also makes for a long cable run to the starter, requiring large wires. So it is time to make a change in preparation for moving the house bank. The plan is to move it right next to the engine starter and eliminate those long and large cables to the starter. The spot where it will be moved is another area that has not yet had a fresh coat of paint and has been used to store bits and pieces of spare parts and equipment. These spaces that I haven't gotten to yet are pretty nasty looking and I feel better with each one that finally gets a fresh coat of paint. Eventually, the entire engine compartment will get done. 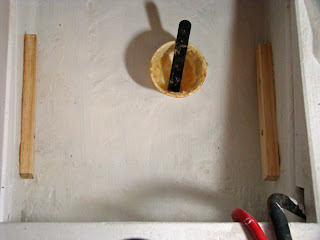 The first step is to clean everything thoroughly and do a good sanding with 90 grit paper on my orbital sander. 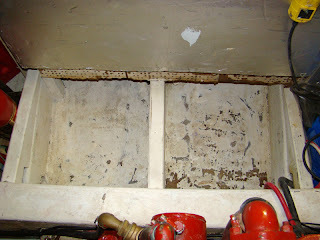 The odd corners get hand sanded and everything is wiped down with mineral spirits. The underside of the fuel tank that I can reach is given a coating of Por15 rust inhibitor. Next comes two coats of my now favorite best bilge paint from the local Lowes hardware store. This stuff does everything I need it to do except apply itself. And it is dry in about an hour. 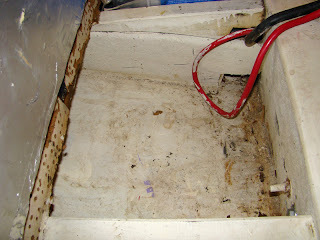 I like the fact that it really doesn't need any sanding, I do anyway, and it is mold and mildew resistant. 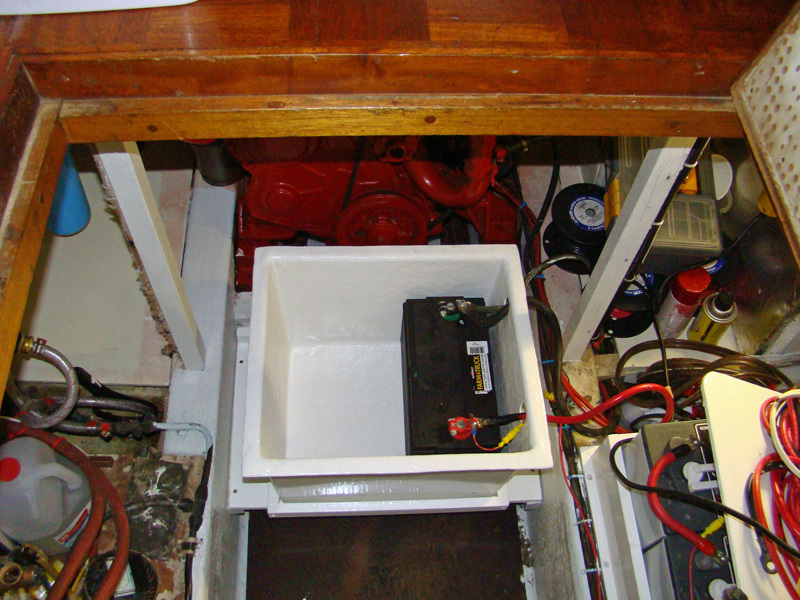 Because of the angle of the bilge here, a "shelf" is needed to keep the battery level, and two supports are epoxied and screwed into the sides of the compartment for added strength to support the battery weight. 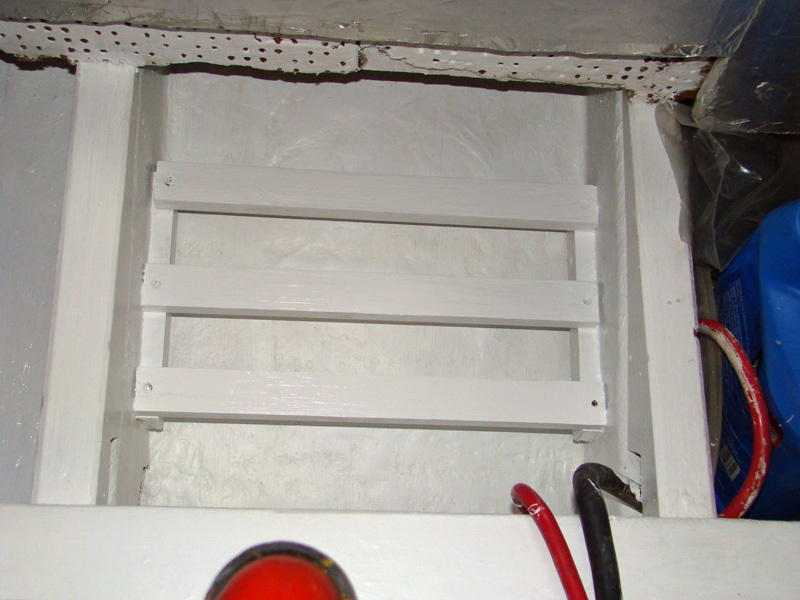 Rather than a flat shelf, I used oak strips so that there would be plenty of air circulation in the compartment and the oak gave it plenty of strength. The "shelf" also got two coats of paint. While I was painting, the section directly adjoining was also done. Every time something gets moved a little, more is painted. With the fresh coats of paint dry, it was time to move the battery. 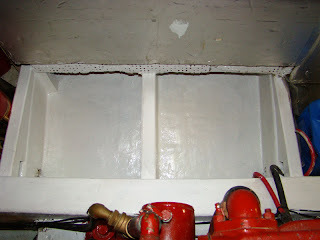 The old cables between the starter and the start battery were removed completely and the connection points on the starter received a good cleaning and a coat of silicone dielectric grease to keep corrosion down. 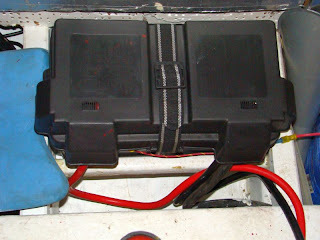 The battery will now reside in a plastic battery box with built-in vents. The cables from the battery to the starter are now about a foot long. The battery end of the cables and the battery terminals also received a coat of silicone grease. There is still a long negative cable that runs from the starting battery to the house bank and the echo charger which keeps it topped off is also run from the house bank. I did have to add a side support to keep the box and battery from sliding around on the new compartment since it didn't quite fit snugly. The new box is secured with a strap that came with it. I doubt it will move around even without it, but better safe then sorry. Now the work can begin so that the house bank will have a new home. The link to "best bilge paint" seems to have died on Lowea end. Could you give me the name of the paint? Visit Our Facebook Page And See What's New. Sign Up Today For Free Email Updates. Please do not copy, reuse, or otherwise reproduce any posting or photographs from this Blog without express permission from the authors. Susan and I are both long time sailors with tens of thousands of miles under our keels spanning the US east and west coast, Bahamas, Caribbean, Central Atlantic, and US Gulf Coast. We have been freelance writers for major boating publications, including Bluewater Sailing, Soundings Magazine, Sail Magazine, Southern Boating, Lats and Atts, MarinaLife Magazine, Nor' Easter, Good Old Boat, Living Aboard Magazine and a host of internet sites. 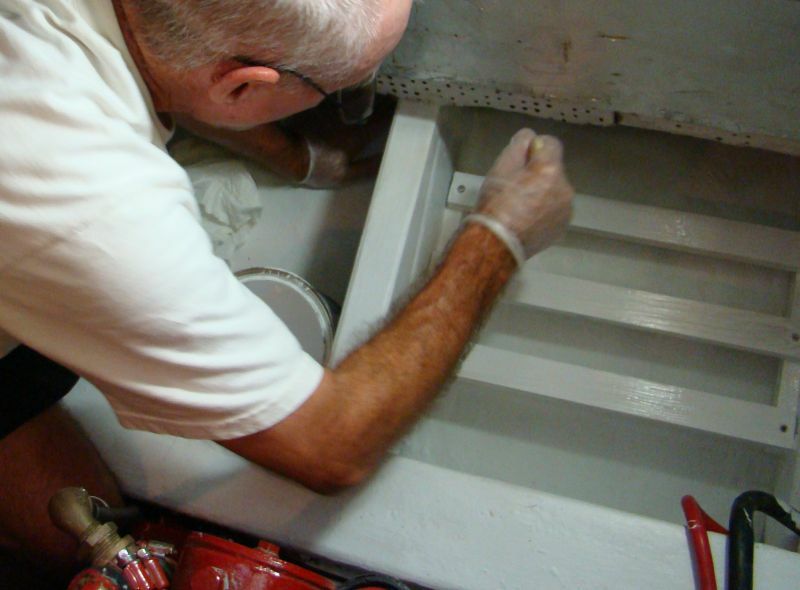 We have spent over 17 years living aboard and cruising our Mariner 40 ketch, Sea Trek. In the not to distant past, we sold her and after much soul searching decided a change in lifestyle and scenery was in order so the search was on for a new boat. We knew a trawler was in our future and after doing a lot of research and looking at a lot of boats we found a very well cared for 1980 Marine Trader 34. We have named her Beach House for Susan's love of the beach and the hopes that the view from our new house will always be pleasant. Our plans are to continue our lifestyle and to change our cruising grounds a bit and visit those inland lakes and rivers we never could with our sailboat. No Copying Or Reproduction Of These Postings Or Photographs Allowed Without Express Permission Of This Blog Owner.